We all have it. Each one of us has something we fear; the unknown; the dark; demonic spirits; spiders or even heights. There is something that causes us to be unsettled; it upsets our balance and causes us to cower, to cringe or to pull back. It may be aloneness, financial poverty, failure, or not being accepted. Some fear success, others being thrust into a crowd. Others would fear recognition while others fear they won’t be seen at all. Some live on the edge of fear; thinking it waits around every corner to grab them and pull them under. For every one of us, that fear is real. Job was a man of great peace. His life was hedged about on every side. He enjoyed God’s blessings and protection. But lurking in the shadows of his mind was something, that if it came, would bring fear with it. For every action, we must stop and count the cost. But there are times when the planning and evaluation need to come to a conclusion and we pull the trigger. There will never be the perfect time or the perfect circumstance. Job saw the obstacles; the trials and calamities of others and wondered; “What if that were me?” Playing it out in his mind, he found fear lurking. Fear of something, that if it came to him, would bring with it, a valley of darkness, a mountain of trouble, or unchartered territory that left him more than just uncomfortable. My fears have been greatly calmed over the years because of who God has become to me. 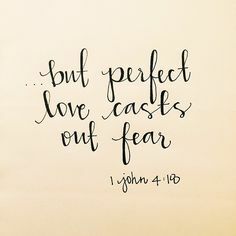 His love, His peace, His protection, His plan for my life; all have greatly settled the fears. I am not completely without fear, mind you. But, I know now where I can run to get what I need to calm any fear that would grip me. It is not a worked up bravado, or a veneer of machismo that shows no fear. It is a quiet knowledge that my God loves me and will do all that He has promised for me to accomplish that which He put me on this earth to do. I know I will face trials, troubles, and storms that may fill my boat to the point that I feel I may drown. But my Lord knows me. He knows the way that I take – and so did Job. An old time preacher; Brother Lester Roloff said this of this passage. You are never so lost, so far away that God forgot you, misplaced you or lost you in the confusion. I take it to heart every time fear rears it’s ugly head. Because, me and God – we can handle anything! I serve the God of the impossible!